A better understanding of the aurora helps to understand more about the relationship between Earth’s magnetic field and the charged atomic particles streaming from the Sun as the solar wind. Prof. Donovan said, “As the satellite flew straight through Steve, data from the electric field instrument showed very clear changes. The temperature 300 km above Earth’s surface jumped by 3000°C and the data revealed a 25 km-wide ribbon of gas flowing westwards at about 6 km/s compared to a speed of about 10 m/s either side of the ribbon. Full report here [plus link to high-res picture of ‘Steve’]. 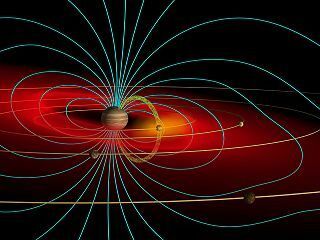 “But even though the solar wind is kept out, it manages to transmit some electric energy to the magnetosphere, by brushing against it–in particular, to the tail region. Let me say here at once, the tail is where most electrons of the aurora seem to come from, which is why in Fairbanks the brightest aurora tends to occur around midnight–even in arctic winter when the sky is dark at most other times, too. “Where electrons move upwards, the mirror force is no problem–on the contrary, it helps push the electrons away from Earth, towards weaker magnetic fields. However, it is a different story where electrons come down. With radiation belt particles, the mirror force keeps them safely away from the atmosphere–but here, those electrons better reach the upper layers of the atmosphere (where the current can continue horizontally to the other branch). If not, the electric circuit remains unclosed! So what happens? In our homes no electric currents will not flow unless a sort of electric pressure pushes them on–a pressure we call “voltage.” In the home it measures 110 volt, average value (actually it fluctuates, being AC). Space currents also have a voltage pushing them, something like 40,000 volts. There is a strong geomagnetic storm caused by the coronal hole. During strong magnetic storms, there is an increase in lava levels in volcanoes. The level of aggression in humans is also increasing. 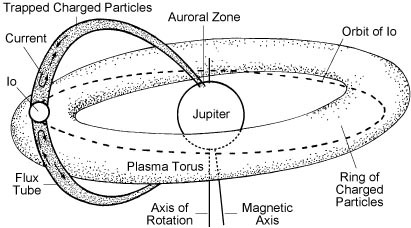 Another magnetic field reconnection or rearrangement ultimately produces the aurora. The long stretched field of the magnetotail is unstable. The stretched field lines snap like elastic bands and rearrange to form two regions, one controlled purely by the earth’s field and one that is part of the solar wind again. The earth’s part contracts rapidly accelerating its trapped particles towards us. The final twist, or rather corkscrew, is that the trapped particles follow spiral paths around the magnetic field lines as they accelerate towards Earth. Some feed the equatorial radiation belts. Others spiral along field lines joining the polar ovals. These eventually plunge into the upper atmosphere to make aurorae. However, because the particle clouds in the contracting fields can equally go northwards or southwards along a field line connecting both ovals (and some particles oscillate between the two), the resulting Aurora Borealis and Aurora Australis are mirror images of each other. Is the magnetic field produced by the aurora borealis pushes ozone from the poles of the Earth? In this work a new explanation for the depletion-recovery cycles of the ozone layer in polar latitudes is presented based on the interaction between the Earth’s magnetic field and gaseous molecules paramagnetic or diamagnetic in nature. Thus, molecules forming part of gaseous substances like NOx, O2, ClOx, are paramagnetic and upon interaction with the Earth’s magnetic field they would be continuously transported from the geographic areas where they are produced by natural or human activities towards the North and South poles following the direction of the force lines of the magnetic field. Likewise, the diamagnetic ozone molecules would tend to become shifted by the magnetic field towards equatorial latitudes. Eventually, superimposed to this continuous flux, diffusion and/or convection (winds) driven fluxes may also play a role. 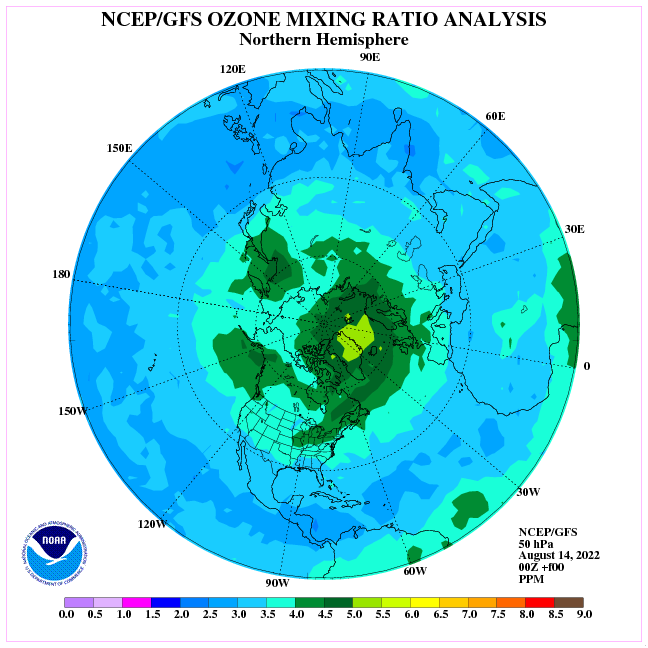 During polar winters, the presence of high concentrations of gases formed by paramagnetic molecules, like NOx and ClOx, accumulated by the continuous transport induced by the terrestrial magnetic field, would chemically attack ozone molecules present in those latitudes, significantly depleting its concentration. Furthermore, the rate of the ozone depleting reaction is known to become enhanced by the presence in the atmosphere of little ice needles formed as consequence of the low temperatures and which act as necessary third bodies receiving the excess energy released during the chemical or photochemical reaction of conversion of ozone in oxygen. Therefore, the oxygen concentration would increase during the whole winter time due both, to its formation as a product of the ozone depletion reaction and also as a consequence of the paramagnetic nature of the oxygen molecules and their consequent magnetic induced transport towards the poles. Simultaneously, the ozone concentration becomes depleted without disposing of any mechanism of regeneration, since no photons reach the polar latitudes during the polar night, whose presence could induce the photochemical reactions necessary for the ozone formation. Thus, at the beginning of the spring time some photons reach the polar latitudes and, in the presence of high concentrations of oxygen, a photochemical regeneration reaction of ozone begins, which becomes accelerated the longer the days are and, therefore, the longer the illumination times. Furthermore, at higher temperatures a decrease of the number of ice needles in the air would determine a corresponding decrease of the third body effect and, therefore of the rate of the ozone degradation reactions. In this way, it can be understood the sudden recovery of the ozone layer detected at the beginning of the summer in both poles. The process would compete with photochemical degradation reactions of the ozone layer. 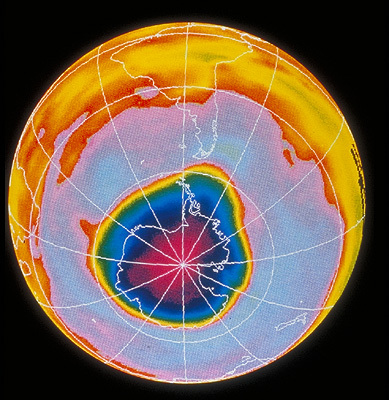 In autumn, the illumination times begin to become shorter, so that less and less ozone is formed by photochemical reactions, whereas the chemical destruction reactions of ozone continue, explaining the new decrease of ozone concentrations measured at that time.In summary, according to the arguments expressed above, the ozone layer is submitted, in polar latitudes, to annual depletion-recovery cycles, which can be explained as consequence of transport mechanisms of gases formed by molecules paramagnetic and diamagnetic in nature. If this were the cause of the ozone cycle detected, any influence of solar winds on the local intensities of the Earth’s magnetic field should produce corresponding variations in the formation and degradation’s rate of ozone. In general, any variation measured in the Earth’s magnetic field, whatever would provoke it, should lead to measurable effects on gases transported polaror equatorial-wards. Terminology like this is a bit suspect IMO. A magnetic field line is a concept, not a 3D physical reality. It’s in a similar category to a contour line on a map i.e. on the ground it doesn’t exist in its own right. But given that limitation, the observations are still interesting. Then there are magnetic flux tubes to consider. we’d be kaput – or non-existent. ESA’s Swarm mission has discovered that this seasonal variation of Birkeland currents, strong electric currents in the upper atmosphere, is not the same in the north and south polar regions. These hemispheric differences may relate to asymmetry in Earth’s main magnetic field. In auroras, blue is a sign of nitrogen. Is Steve a Birkeland Current?